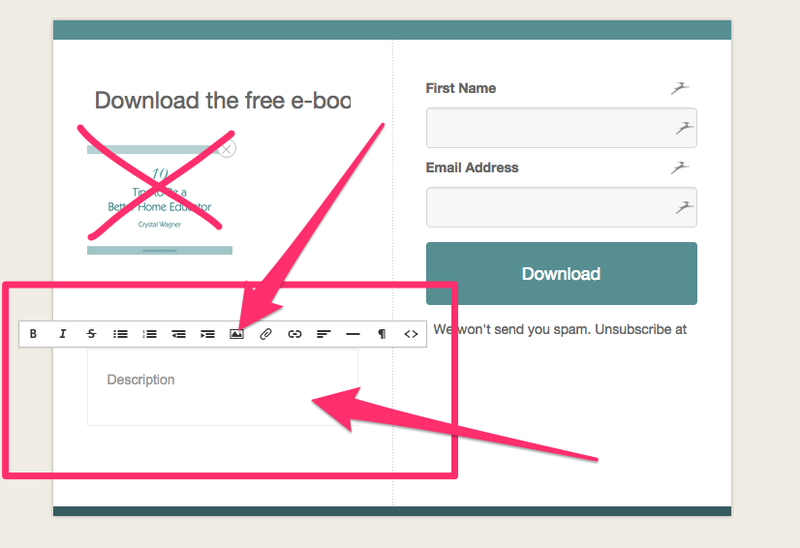 How to add images to Forms and Landing Pages, and some best practices. Images can create higher conversions. When you can see what you're getting (even when that "thing" is a digital product), you're more likely to feel a connection with it and want to have access to it for yourself. Getting the right dimensions for the images is important for the overall look and feel of your Forms and Landing Pages. This article is designed to make that easy. Pro Tip: When you're wondering what your final Form or Landing Page will look like, click the Preview option at the top of the page. In July of 2018, we released the New Form Builder! Any previously existing Forms will still use the Legacy Form Builder, for which the instructions below will be helpful. If you are looking for images sizes for the New Form Builder, keep scrolling! To begin with, the Full Form Style is the only form that allows you to add an image to it. Once you have your text and colors setup (you can change the colors using the magic wand icon at the top of the Form Editor), you'll want to add your image. One of the most common questions we get is, "What is the are the best dimensions for my image?" Simply put, any dimension will work, and roughly 300px wide is the best bet for Forms. Of course, you want it to have some balance with the rest of the Form, so you can change the image size to your own preference! This way, you can upload images at your own dimensions until it looks just right for you. Landing pages have the ability to hold multiple images, depending on the style of page you build. Adding to that, there are 18 different Landing Page Templates available for you, so the sky really is the limit! When you're ready to add your image, simply click on the image placeholder, inside of your template. On the righthand side, you'll see an option pop up to allow you to upload your image directly into the template. Click on this, select your image, and it will automatically begin loading! One thing to keep in mind: it's a good idea to match landscape images with landscape space on your template. You can upload an image that's not in landscape, if you prefer. Just know that it will adjust automatically to fit the image size, and that might overlap with your template copy. width: 1600px is a good standard. Takes up the width of the page at any size. width: 1600px is a good standard. Takes up the width and height of the page at any size. For the Sidebar Landing Page we recommend a minimum of 900px wide for that banner image, but would probably suggest at least 1800px for best responsiveness across different device sizes. For the Profile style this can be a little more flexible. We still recommend the larger the better. For background images, 1800px is fairly standard, and will ensure it can scale down without losing resolution!